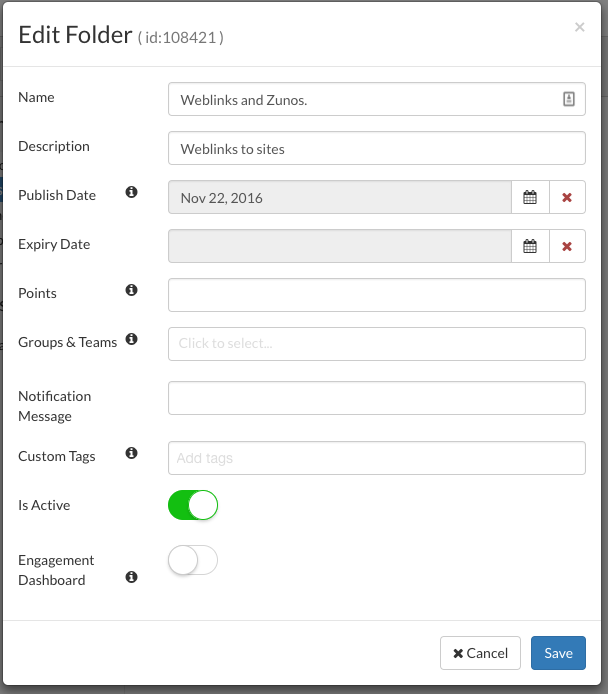 How to set Publish Date for Content folders in the Zunos admin portal. Do not remove this date unless you want to deactivate the content. Click on the title of the folder. Click on the Publish Date calendar button, and a screen like the one below will appear. Choose your desired future publish date. Next, a time option will appear. Choose the time you want your folder content to be published. Ensure the Is Active switch is turned on. Only active content will appear on the publish date. If the publish date is set in the future and the content is active it will not appear on the app until the publish date set by the admin has arrived. Remember to click the Save before you close. Back in the Drive section in the admin portal, a clock icon will show on the right side of the Content to indicate that a publish date and time has been set, and the content will become available at the set published date and time. Use the mouse to hover over the clock icon to view the Publish Date.